Combining classic weather-resistant performance with an innovative merino mesh lining to aid in moisture management, the Coriolis Hooded Windbreaker is a technical lightweight shell layer for travels, trail runs and other active days in unsettled weather. This innovative layer features a wind- and water-resistant Pertex® Quantum Air face fabric with a DWR finish to shed blustery conditions. Inside Icebreaker lined the jacket with a lightweight eyelet mesh corespun fabric, which aids in moisture transfer and provides the ultimate combination of next-to-skin softness and durability. An upper back yoke vent as well as strategically placed laser-cut holes maximize the jacket’s ventilation performance, while the raglan sleeve construction improves mobility during active pursuits. A fitted hood adds protection when the weather turns, zippered hand pockets secure your essential items, and reflective hits improve visibility in low-light conditions. 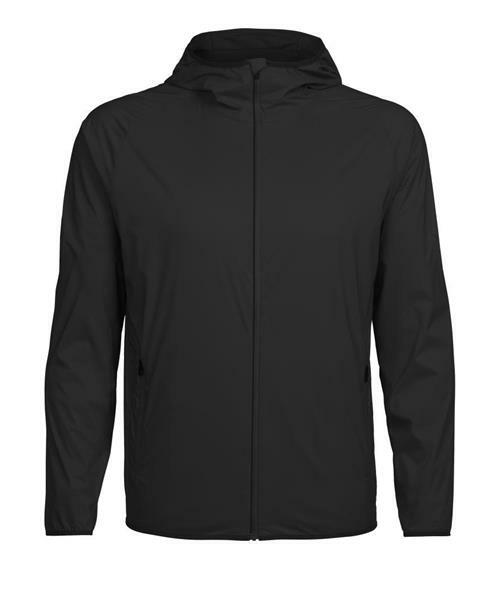 * Center back length: 72cm/28¼"
Coriolis Hooded Windbreaker - Mens is rated 4.6 out of 5 by 14. Rated 4 out of 5 by Bloopie from Great shoulder season jacket Bought this in the Mediterranean/monsoon. Colour was a lot less vibrant than I was expecting, but that was a minor disappointment. Everything else is top notch. Rated 5 out of 5 by ChubbyFrancis from love it Saw a colleague wearing it, really loving it since then. Love the light yet warm construction, and quality and style. Finally got my own. Too bad it is winter now, can only try on in the closet and have limited use until it warms up again. And the holes on the back should keep me cool in the summer. Should be lightly water resistant and quick drying. Rated 4 out of 5 by DavidCouillard from Looks nice but a little short I usually wear Medium for anything top layer in IceBreaker. But this windbreaker runs a little short. Like it will show the base of my back if I bend down to tie my shoes. But it looks great and fits nicely on the arms and shoulders. Rated 5 out of 5 by CSCIronman from Great lightweight shell Very comfortable fit, great lightweight shell for unsettled weather. Fitted hood adds extra protection. Good ventilation so you can get both protection from the elements, but not overheat. Lightweight so it packs up small and very light. Rated 5 out of 5 by IcebreakerKing from Fits great, looks great. Love this jacket. It's super versatile - can wear it in light rain, strong wind, or a cool summer night. The fit is exactly as predicted by the fit tool on the website. And I love the colour. Rated 5 out of 5 by CamE from Coriolis Hooded Windbreaker Great jacket for the Fall and cooler summer nights. I'm using this jacket for my hikes when things can change very quickly. Once October arrives, I'm planning to use it for my morning runs as well.